Never would I ever go for using a boxed cake mix unless it were included in a magical recipe that everyone in the world will go ga-ga for. So I had to make this cake. My friend Tessa first experienced it when my Aunt Dana made the cake for my wedding dinner, and now she dreams of it nightly. (Or at least monthly) So I whipped it up for her birthday. Literally — whipped it up! It takes all of 5 minutes to come together, yet tastes like moist cake dreamland. The recipe includes pudding, a whole container of sour cream and 5 eggs — 5! Never said it was respectable. Only delicious to the taste. Heat oven to 350 degrees. Grease bundt pan and lightly dust with flour. Mix all ingredients in a bowl until combined. Pour into bundt pan. Bake for 45-55 mins. 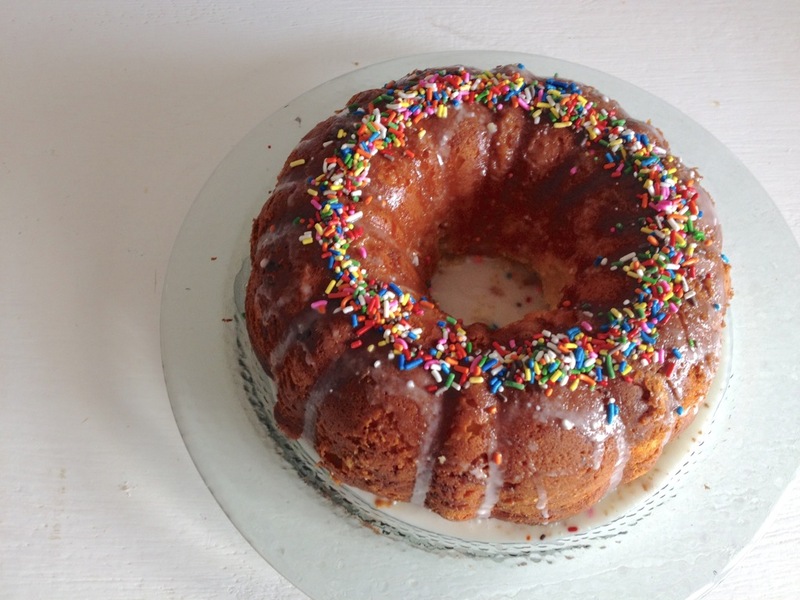 This entry was posted in food and tagged baking, bundt cake, tessa's birthday. Bookmark the permalink. I think you forgot the 2 sticks butter……I am dreaming about that cake right now. Best recipe ever.